Geneva, 6 July 2016 – Finland, Switzerland, Sweden, Israel, Singapore, the Netherlands and the United States are leading the world when it comes to generating economic impact from investments in information and communications technologies (ICT), according to the World Economic Forum’s Global Information Technology Report 2016, which is published today. On average, this group of high-achieving economies at the pinnacle of the report’s Networked Readiness Index (NRI) economic impact pillar scores 33% higher than other advanced economies and 100% more than emerging and developing economies. The seven are all known for being early and enthusiastic adopters of ICT and their emergence is significant as it demonstrates that adoption of ICTs – coupled with a supportive enabling environment characterized by sound regulation, quality infrastructure and ready skills supply among other factors – can pave the way to wider benefits. The breakaway of these seven economies is significant for other nations given the role that networked readiness is likely to play as the world transitions to the Fourth Industrial Revolution. The Global Information Technology Report2016 finds high levels of confidence among business leaders that capacity to innovate is increasing, which suggests that other nations, too, could start to see more economic and social impact from ICT. However, on a cautionary note, the NRI data also suggest that individuals are driving ICT adoption much more enthusiastically than either governments or business, where no clear trends are discernible across regions since 2012.
Who leads the Networked Readiness Index in 2016? 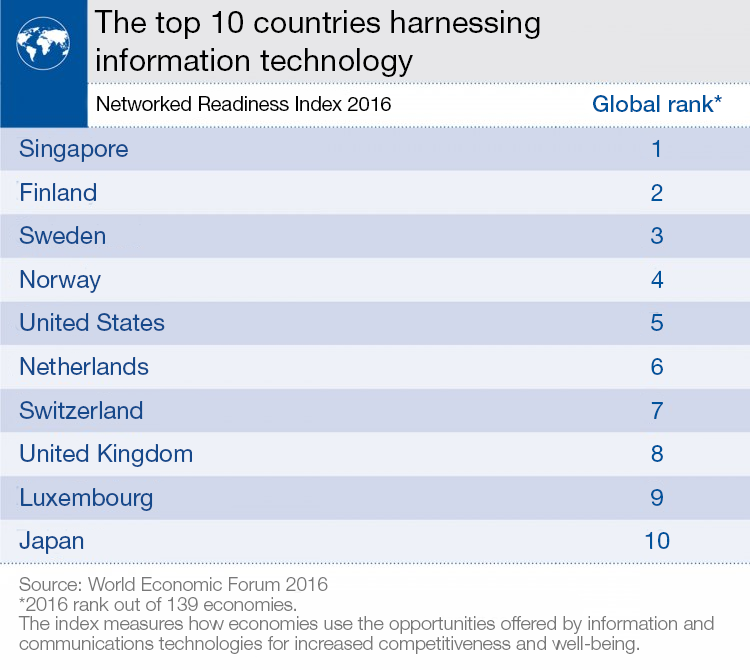 The 2016 edition of the NRI finds Singapore as the highest-placed country in the world when it comes to networked readiness. Finland, which topped the ranking in 2014, remains in second place for a second year in a row, followed by Sweden (3rd), Norway (4th) and the United States (5th), which climbed two places. Making up the rest of the top 10 are the Netherlands, Switzerland, the United Kingdom, Luxembourg and Japan. While the upper echelons of the NRI continue to reflect a strong correlation between networked readiness and per capita income, roughly 75% of the countries included in this year’s index show a score improvement in 2016. However, convergence both at the global and regional level remains elusive, with four regions – Eurasia, Emerging Europe, the Middle East, North Africa and Pakistan (MENAP) group, and sub-Saharan Africa – having widened the gap between the most and least networked-ready since 2012. Elsewhere in the NRI, of the large emerging markets, Russia remains unchanged at 41st position. China comes next, moving up 3 places to 59th. South Africa improves markedly, climbing 10 places to 65th, while Brazil partially recovers from a previous downward trend to 72nd this year and India drops two places to 91st. Europe remains at the technology frontier; seven of the top 10 NRI countries are European. Yet the performance range is wide, with Greece dropping four places to 70th position and Bosnia and Herzegovina closing the group at 97. Several Eastern European countries, notably the Slovak Republic, Poland and the Czech Republic, are making big strides, landing spots in the NRI top 50. Better affordability and large improvements in economic and social impacts are making major contributions to this success. Italy is another notable mover this year, improving 10 places to 45th position as the economic and social impacts of ICT are starting to be realized (up 18 in the global impact ranking). The Eurasia region continues its upward trajectory, with the average NRI for the region increasing significantly since 2012. In particular, it is notable that the improvement is observed across all four elements that make up the index: environment, readiness, usage and impact. The region is led by Kazakhstan, which continues on its positive trajectory of recent years to land in 39th position. Malaysia leads the Emerging Asian economies in 2016 and moves up one spot to 31st position overall. The country continues to perform strongly, supported by a government which is fully committed to the digital agenda. The top five in the region in terms of overall ICT readiness remain Malaysia, Mongolia, Thailand, China and Sri Lanka as in 2015. The group of Emerging Asian countries has been moving up and converging since 2012. Individual usage in the region is still one of the lowest in the world, but has been growing strongly in recent years. The performance range by countries in the Latin America and Caribbean region remains widely dispersed with almost 100 places between Chile (38th) and Haiti (137th). There was no clear trend from 2015 to 2016 in terms of relative performance, with Chile and Haiti staying put and, of the remaining group, half of the countries improving their ranking and the other half dropping. Considering the absolute NRI score, however, the region has been moving up and converging since 2012. In order to foster the innovation forces that are key for thriving in the digitized world and the emerging Fourth Industrial Revolution, many governments in the region will urgently need to reinforce efforts to improve their regulatory and innovation environments. “Measuring the economic and social impact of the digital economy is important for making appropriate policy decisions in both developed and developing economies. The Networked Readiness Index is a valuable tool for helping public and private sector leaders in leveraging the potential of technology.” – Soumitra Dutta, Cornell University. ‘ “Digital” is not just about technology. It is a state of mind, and the source of new business models, new consumption patterns, new ways for business and individuals to organize, produce, trade and innovate. In the global game of digital innovation, the performance and progress made by emerging economies such as Singapore, the United Arab Emirates or South Africa for example are remarkable: they may hold the promise of even more spectacular improvements in the ways digital technologies will be harnessed to competitiveness, growth and social progress in the coming years.’ – Bruno Lanvin, INSEAD. “Going forward, it will be important to reinforce data gathering efforts in order to more closely track the distributional impacts of the current transformations. This will make it possible to shape the digital economy in a way that delivers broad-based gains.” – Silja Baller, World Economic Forum. What does the Global Information Technology Report 2016 tell us about the Fourth Industrial Revolution? How much innovation is “digital”? As the global economy becomes increasingly digitized so, it would seem, innovation is becoming much less defined in a narrow technological sense. For example, while the report finds business model innovation on the rise in more than 100 countries, it also finds stagnation in the Business Usage pillar. This would suggest that while innovation is a top priority for many businesses, they are still missing out on opportunities for greater impact through ICT adoption. Patents are declining as a measure of innovative capacity: While the minds of business executives around the world are increasingly focused on innovation, traditional measures for innovation such as the number of patents registered are telling a smaller and smaller part of the story. This may be related to the fact that the current transformation is nurtured by a different type of innovation, increasingly based on digital technologies and on the new business models it allows. The ICT infrastructure gap remains a chronic challenge and is getting wider: Of the 12 pillars of the report, infrastructure is the one where improvement is least pronounced. Worse, since 2012 the lowest-ranked countries have been reporting a deterioration in their infrastructure in absolute terms. Infrastructure is a key determinant of a nation’s ICT-readiness alongside affordability and skills, acting as a gateway to increased usage and ultimately economic and social impact. Social impact needs new momentum in important areas but is picking up overall: While the social impact pillar of the NRI has seen positive change overall since 2012, most regions register a decline in one of its important components, the impact of ICT on government efficiency. Another important social impact indicator, ICTs and access to basic services, is starting to recover in 2016 after years of decline. This suggests that more people are feeling the benefits of online access to healthcare, finance, insurance and other services. Social impacts on the whole rose most strongly in the group of high-income countries over the year.